Every evening, during the prayer at Brussels Expo, Brother Alois gave a meditation, half in French and half in Dutch. The texts of these meditations is published here. It is a great joy to be in Brussels. We thank the residents of the city and the surrounding areas for opening their doors. At a time when the horizon is darkening for many, it is important for us to come together and express once again the hope that animates us. This hope is nourished by the conviction that new harmonious relationships between people can be born. A new solidarity can renew the life of our societies. These days we will discuss this question, but more importantly, we will experience it. A few weeks ago, twelve of my brothers and I were in Africa and our hearts are still overflowing. With the Churches of Nairobi, Kenya, our community had prepared a meeting of African youth. This meeting brought together 7000 young people from fifteen African countries, together with youth from other continents. We were happy to see the "pilgrimage of trust" extended to Africa. For this meeting we wanted to help build relationships of friendship beyond the wounds of history and the lack of contact between peoples. Though it is impossible to recreate the past, young Africans have discovered the joy of crossing borders and showing hospitality to one another. In the face of the divisions that are tearing the African continent apart, many people continue to strive courageously for reconciliation and pacification. Christians are called to hold on firmly to this hope: the bond of baptism in Christ is stronger than divisions. There are Christians who have paid for that conviction of faith with their lives. And now, I continue in Dutch. One day, during the meeting in Nairobi, there was a moment of sharing with the Rwandans, more than 250 of whom came. A girl named Clarisse uttered the words that I want to entrust to you. Among these young people from different countries which are undergoing trials, although there were troubles there was also happiness. Surprising as it may seem, in Africa the difficulties of life do not banish joy; a serious outlook does not exclude dancing. During the prayers together, vitality sprung up in the songs of praise. Then a long silence expressed everybody’s longing, whether from Kikujus, Luos, Masai, Congolese or Rwandans. Their longing is also ours: peace of heart and peace for the entire human family. We would like to be inspired by these African Christians, to be in our turn bearers of hope and joy where God has placed us. In the Letter from Kenya which you have been given, there is an image of an African Christ. That Christ is here, in the place of silence. We can go there whenever possible and pray for the different peoples of Africa. It is true that we rarely see the results of our prayers. But suppose prayer for others meant plunging ourselves into the current of love that circulates between God and human beings. Then we might understand that our prayers will help to ensure that God’s love reaches all people beyond the obstacles that always arise. Yes, God hear our prayers, even if we do not know how. A child: Every night we are going to mention the names and pray for the peoples who are here. This evening we welcome those from Norway, Sweden, Finland, Denmark, Portugal, Spain and Italy. Yes, it is essential to be attentive to the presence of God in our lives. There we can draw hope and joy. And to discover the presence of God better and better, how aware are we that we have that treasure which is the Bible? In October I was in Rome for three weeks, invited to a Synod that brought together bishops from all continents. The subject was the Bible, the Word of God, and its place in our lives. We heard testimonies from around the world. Some were like pearls of great price. A bishop from Latvia said that, in his country, during the Soviet regime, priests and ordinary believers died for proclaiming the Word of God. A priest from Latvia called Victor was arrested one day because he had a Bible. The agents of the regime threw the Bible on the floor and ordered the priest to trample on it. But he knelt and kissed the book. As a result he was sentenced to ten years’ hard labor in Siberia. When you hear an account like that, you understand how deeply the Bible has been loved and has transformed the lives of so many people. The Synod expressed a great concern to pay much more attention to the Bible. A cardinal thanked Reformation Christians for their attentiveness to the Bible. A bishop said, "In the Catholic Church there was a reaction against the sola Scriptura of the Reformation, and we have minimized the importance of the Bible. Now we are leaving that period behind." Of course, it is not always easy to read the Bible; we find texts we do not understand. To make reading easier, it is important to emphasize two access routes. The first is this: what lies at the heart of the Bible is God’s love and the love of neighbor. The Bible is the story of God’s faithfulness. The other route to the Bible is this: the Gospel tells us that Christ himself is the Word of God. When we read the Scriptures we encounter him, Christ; we hear his voice, we enter a personal relationship with him. That is why, in Taizé, we love to sing a few words from Scripture. A song that is repeated enables us to interiorize the words. We also love long moments of silence when we are together. In the silence, particular words can grow within us. And we have learned from Eastern Christians to love icons; they are all steeped in the Bible. And now I end with a concrete project. The Word of God unites us beyond the divisions. It also unites us, beyond borders, with those who are very far from us. And tonight we are happy to be able to give a concrete sign of this unity, specifically with the Christians of China. In the coming year, in 2009, we will express a sign of love and communion for the people of China. With the help of "Operation Hope" and those who support it, we will print in China and distribute in the various regions of that vast country a million Bibles. Tomorrow night, I will say a few words about the message to the European Union that you found in the Letter from Kenya, and I will announce the next stages in our pilgrimage of trust on earth. A child: Every night we mention the names and pray for the peoples who are here. This evening we greet the participants from Belarus, Russia, Ukraine, Georgia, Albania, Serbia, Bosnia-Herzegovina, Romania, Montenegro, Lithuania and Slovakia. We greet those from China, Korea, Japan, India, Indonesia, Philippines and Vietnam. We greet the bishops and leaders of the Catholic, Orthodox, Anglican and Protestant Churches as well as the leaders of the European institutions, from Belgium and Brussels, who are here tonight to pray with us and who are sitting next to the brothers. And finally, with all the warmth of our hearts, we greet particularly the presence of Her Majesty Queen Fabiola of Belgium. During these days, we are asking ourselves how we can clear away whatever obstructs the source of hope and joy in us. Would it not be primarily by seeking to discover the presence of a loving God in our lives? For some of our contemporaries, to hear such words about the love of God sometimes seems too easy. Many are seriously seeking meaning in their life and yet cannot believe in a personal God who loves them. Do we pay enough attention to those who seek faith but for whom God remains elusive? At Christmas we celebrated the birth of Christ, through whom God comes close to us, but we do not want to forget that God will always remain beyond what we can understand. Let us open wide our hearts and our minds to these two dimensions of the mystery of God: his closeness and his transcendence. Not everyone is able to grasp these two dimensions. Some are affected by God’s presence close at hand; it is almost something their heart can feel. Others, such as Mother Teresa, experience God especially in his silence, sometimes for long periods of their life. The important thing then is to walk together in the steps of Jesus: He experienced both the great nearness of God and also, especially on the cross, God’s silence. We follow this Jesus and it is to him that we cling. Christian faith is then seen as a risk, as the audacity of trust. At the end of the Letter from Kenya, you found a Message to the European Union. That is because we are in Brussels, the headquarters of many European institutions. Why this message? Our European meetings have contributed for over thirty years to deepening mutual knowledge between European countries. Yes, we want an open and united Europe. And we would like the European institutions to do all they can to move in that direction. Europe has succeeded in opening a period of peace without precedent in its history. There are Christians who have dared to initiate unexpected acts of reconciliation between the peoples of Europe. Will you young people continue to build this peace? Will you ask yourselves how you can help to build an open Europe, a land of solidarity? Two weeks ago, I came to Brussels to bring this message to Mr. Jose Manuel Barroso, the president of the European Commission. In doing this I wanted to express the hope that our "pilgrimage of trust on earth" may bear fruit in the life of societies as well. And now some news. Together we will continue the "pilgrimage of trust." 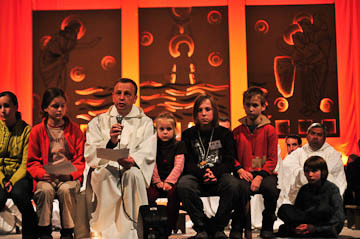 There will be meetings in Taizé throughout the year. And there will be a European meeting a year from now. It will be held in a city where we have been expected for a long time and where we will be warmly welcomed. The archbishop of that city is here with us tonight. The next European meeting will be held, from next December 29th to January 2nd, in Poland, in the city of Poznań. We will not just continue the pilgrimage in Europe, but on other continents, too. After Africa, we will return to Asia. In a little over a year, from February 3rd to 7th, 2010, we will be welcomed in the Philippines, in the city of Manila. "Like other young people, we too have dreams and struggles. And we want to search for the truth to be found in living in the spirit of Christ. The Pilgrimage of Trust will give us a boost. It will help us to deepen our faith and our commitment to live in communion, in the Church and in our society. It will also help us to unite not only Filipinos but other young people who are involved in their places. "On this journey, we would also like to share with you our life, our joys and our hopes. We wish to share our faith with you and then open new paths of hope together. We need support from you young Europeans, and that is why we would like to invite you and to welcome you, the young people of Europe, for the Pilgrimage of trust in the Philippines." A child: Tonight we greet the participants from Greece, Moldova, Croatia, Hungary, Bulgaria, Slovenia, Macedonia, Kosovo, Estonia, Latvia, Czech Republic and Poland. We also greet those from Argentina, Bolivia, Chile, Brazil, Mexico, Guatemala, Colombia, Canada and the USA. We greet the archbishop of Poznań, Archbishop Gądecki, Bishops Gurda and Polak from Poland, Bishops Daucourt and Maillard from France, and Pastor Reymond from Switzerland. We are very grateful for the warm welcome we have received. Our heartfelt thanks goes to those who opened their doors. Thank you to the Church leaders that lent their support during the preparation. And thank you to the civil authorities who worked together with us. These days we have had this experience: coming together in such a beautiful communion brings to birth hope for our personal life, for society, for the world. This communion lived out in a concrete way even opens us to a new understanding of God. When we return home, all of us would like to pass on this hope. It will be important then to come back constantly to the source. That source is there, very close to us, and even in us. It consists in a personal communion with Christ. Each morning, let us listen to his love! It brings us back to life. I reminded you that, to walk in faith, we have that treasure which is the Bible. Sometimes we remember only a few words, but the important thing is to put them into practice. By putting them into practice, we understand them better. So everyone can leave Brussels asking themselves: what words have touched me that I can put into practice? In your life of faith, do not remain alone! In your local church, even two or three people can help one another to pray, to deepen their trust in God. We, the brothers of Taizé, would like to support you wherever you are. But we are a small community whose primary vocation is to live a life of community either in Taizé or in our different fraternities around the world. For my part, this year I will be happy to go with some other brothers to four countries. In early May we will have a stage in the pilgrimage of trust for the first time in the Baltic countries, in Vilnius, Lithuania. Then another stage in Seville, Spain, and then later on in Stuttgart in Germany and Pécs in Hungary. These days many of you spent some time praying in the place of silence. There you were also able to receive the sacrament of reconciliation, or simply to be listened to. Many of you confided a question or an experience of suffering or joy. How can we live out better the ministry of listening in our churches? There are men and women ready and able to do this. Being welcomed personally, confiding in someone is vital so as constantly to renew our trust in God. God gives us this peace. But it is not imposed from above. The Gospel tells of the unbelievable way in which God acts with humanity. God asks everyone to take part in his work of reconciliation and to help create new harmonious relations among humans. What commitments are within our reach, given the complexity of the issues that surround us—poverty, different forms of injustice, threats of conflict? Is it not to go towards others in great simplicity? Let us go towards the most vulnerable! Let us visit those who are excluded or abandoned! Let us try to put into practice signs of an open and united Europe, in particular with immigrants, who are so close to us and yet often so far away! In this way we will discover the presence of Christ even where we would not have expected to find him. Risen, he is present in the midst of human beings. He goes ahead of us on roads of compassion. And already, by the Holy Spirit, he is renewing the face of the earth; he makes it possible to hope. A child: Tonight we greet the participants from Austria, Switzerland, Britain, Ireland, France, Germany, Netherlands, Luxembourg, and the young people of Belgium. We greet those from Congo, South Africa, Niger, Mauritius, Gambia and Australia.